When solar supporters like you stand up together to fight for our energy rights, we win! As an electric utility customer, you pay your monthly bill in exchange for electric service provided to your home, business, or other facility. But what you may not know is that some of your money is used to directly influence political candidates, state level policy, and national interest groups—all of which affect your utility rates, and options as a customer. If you’re a rural electric cooperative member-owner, things are a little different. We’ll cover Virginia’s electric cooperatives in a future post. This post is focused on Dominion Energy and Appalachian Power. We’ve talked before about how our monopoly utilities work behind the scenes to rig the game in their favor—and why they fight rooftop solar. Here is how you pay for it. Dominion Energy Virginia and Appalachian Power are investor-owned utilities (IOU’s). They are private companies that generate returns for shareholders but operate as regulated monopolies in Virginia. As monopolies, they are regulated by the Virginia State Corporation Commission (SCC), which determines fair rates, approves infrastructure investments, and allows the companies a guaranteed “reasonable” profit for providing electric service to customers in a specific service area. Regulated monopolies are not allowed to use these profits—generated from “captive ratepayers” like you and me—to directly lobby and influence policy affecting monopoly customers. This is true in theory but not in practice. Profits from the regulated entity filter up to an unregulated holding or “parent” company not subject to the same restrictions on lobbying. If you are a Dominion Energy Virginia or Appalachian Power customer, the profits made from providing your electric service end up in the hands of the two parent companies (Dominion Energy and American Electric Power respectively). These companies are unregulated at the state level, and are therefore free to use their money, power, and influence to lobby on issues directly impacting their regulated subsidiary. The result is that some percentage of your electric bill is used to lobby in ways that are not transparent and, in many cases, work against your best interests as an electric customer and solar supporter. Here is how this works in practice. In a report from August 2018, the SCC concluded that Dominion Energy Virginia overcharged Virginia ratepayers by $302.6 million in 2017. Simply put, that’s hundreds of millions of dollars that should have stayed in their customers’ wallets. Instead of returning that money, Dominion Energy (the unregulated parent company) spent more than $1 million on “lobbyists, entertainment, meals and communications” to influence last year’s passage of SB 966, the so called “rate freeze” bill. Among other things, the bill makes it harder for the SCC to force Dominion to return future over-charged profits to ratepayers. It also directs overearnings to be used for “grid infrastructure” investments, earning Dominion additional profits. If you believe this is wrong. You are not alone. 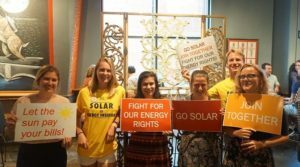 Join us in fighting for your rights as a consumer and solar supporter by signing the Virginia Declaration of Solar Rights. Let your representatives know that you will no longer accept policies that rig the game in favor of monopoly utilities at the expense of a fair, consumer-oriented energy system. Virginians are demanding a clean, democratic energy system that directs control and benefits back to local communities—with solar as the cornerstone. Contact your representatives and declare your solar rights! We pay our monopoly utilities to provide electricity service, not to lobby for political candidates, policies, and regulations that may not represent our best interests. Solar United Neighbors of Virginia is fighting every day on behalf of Virginia ratepayers. Our vision is a clean and equitable electric system that directs benefits and control back to local communities, with rooftop solar as the cornerstone. Monopoly utilities spend $100s of millions of dollars to deny our right to go solar. Enough is enough.